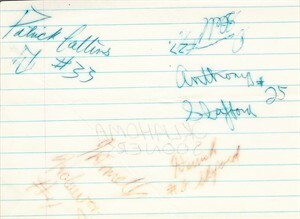 Slightly smaller than 5x7 inch piece of lined paper autographed in ballpoint pen by 5 key players from the 1985 Oklahoma Sooners National Championship football team: star quarterback Jamelle Holieway, star receiver Derrick Shepard (died 1999; father of current OU star Sterling Shepard), running backs Patrick Collins, Damon Stell and Anthony Stafford. 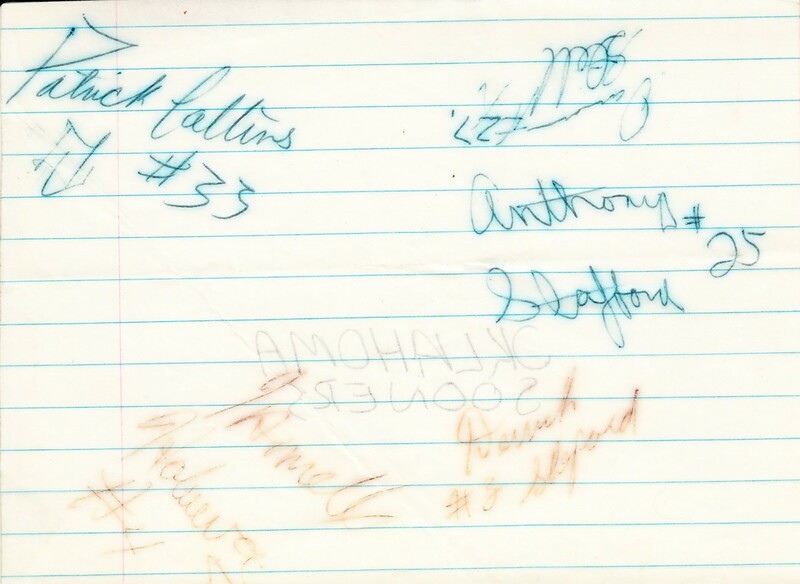 Signatures have moderate age fading; paper is laminated and OKLAHOMA SOONERS is written on the back. Obtained in person in Miami prior to the Orange Bowl. With certificate of authenticity from AutographsForSale.com. ONLY ONE AVAILABLE FOR SALE.